HONOLULU — Six arrests were made when protesters tried to block an equipment convoy for a solar telescope being built on a Hawaii mountain held sacred by some Native Hawaiians. Police arrested two women and four men early Wednesday, according to state, county and federal agencies. They were among more than 100 protesters who gathered starting Tuesday evening in an attempt to block the convoy of trucks from reaching the summit of Maui's Haleakala. One arrested man was taken by ambulance to an emergency room, where he was evaluated and released back to police custody, Maui police said in a statement. Despite the protests, a four-meter mirror system for the Daniel K. Inouye Solar Telescope was delivered safely, telescope officials said in a statement. "The project made concerted efforts to identify and mitigate cultural and environmental impacts associated with the construction of what will be the world's most powerful solar telescope," the statement said. "Like those who protest our facility, we too respect and value our planet, broader universe and our shared origins." Construction is on-schedule to be completed by 2020, telescope officials said. The construction progress of the $340-million solar telescope is unlike another embattled telescope planned for a different Hawaii mountain. Construction of the $1.4-billion Thirty Meter Telescope on Hawaii Island's Mauna Kea is stalled amid protests and a state Supreme Court ruling invalidating its building permit. Opponents of both say the telescopes will desecrate sacred land. Honolulu couple Mahealani Ahia and Kahala Johnson said they flew to Maui to protect Haleakala from the solar telescope. They said they were among the protesters who laid down on a road with their arms connected by PVC pipes. "Police officers gently lifted the prone protesters to the highway's shoulder to give the big rigs enough turning radius," said a joint statement by the state Department of Land and Natural Resources, Maui police and Haleakala National Park. Ahia and Johnson said police used too much force on the man who was taken to an emergency room. He was "taken down" by at least five officers, Johnson said. The man fell to his face onto the asphalt, he said. "He was literally knocked out," said protester Kaukaohu Wahilani. 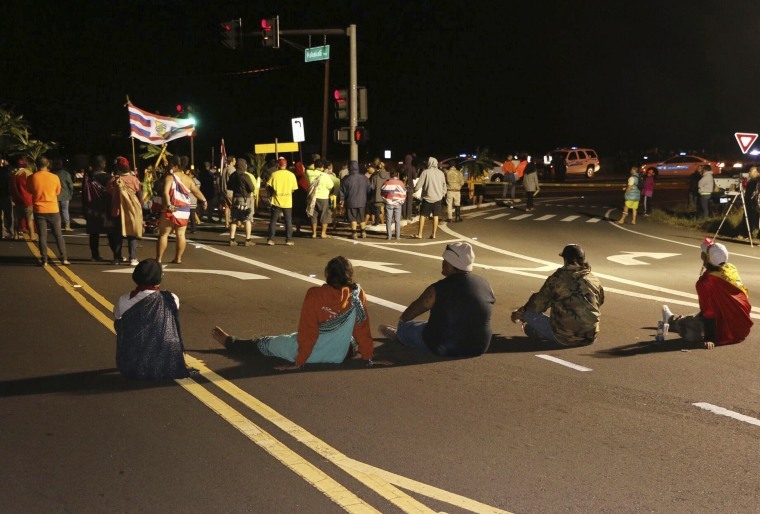 "They were using force against non-violent protectors," said protester Iwiulaokalani Keohokapu. Police didn't immediately respond to allegations of excessive force. Some protesters threw themselves in front of trailer tires, police later said in a statement: "After repeated warnings and requests by police to desist, officers had to forcibly remove the protesters from in front of the truckers and the trailer tires." Ahia and Johnson said they oppose the telescope in honor of their ancestors and their deceased 2-year-old daughter, Hina. "As a lineal descendant from Maui, I have a kuleana (responsibility) to protect Haleakala and our sacred sites," Ahia said. "We don't really consider this a defeat. ... "We'll live to see the time when there are no more telescopes on our sacred sites."